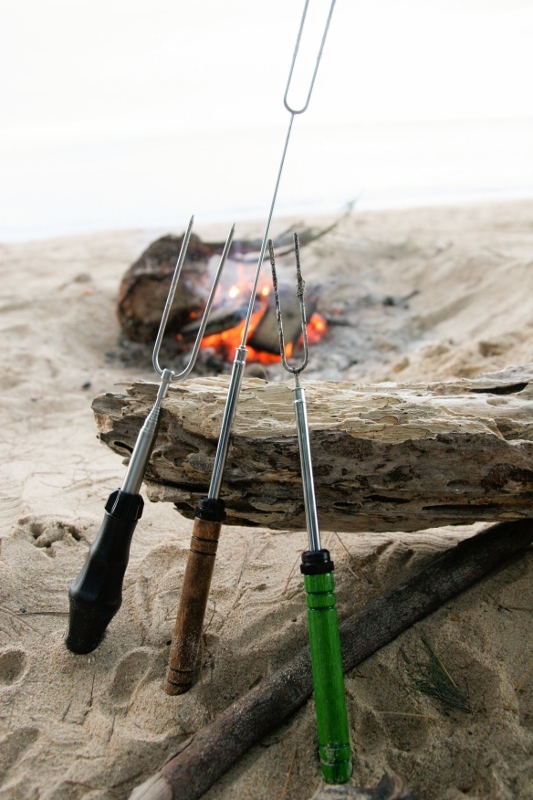 The barbeque fork and the Rolla Roasters- the original marshmallow toasting forks- will take your campfire cooking experience to the next level. You’ll definitely want to check out the Buzzfeed article- 41 Genius Camping Hacks- before your next camping trip! The Rolla Roaster favorites are upgraded recipes to use with your original marshmallow toasting fork…S’moreos for the kids and Bailey’s dipped toasted marshmallows for the adults. Plus, how to remove a tick, reduce itching from mosquito bites, and smart packing ideas. Check out our website for other great family camping ideas at www.RollaRoaster.com. The Folding Camping Fork is a sturdy barbeque fork that you will definitely want to get in your camping arsenal before heading off on your next trip. This hard-core cousin to the Rolla Roaster, the original marshmallow toasting fork, can hold up under heavy cooking loads and folds up neatly into a carrying case. Designed to be the most compact and versatile barbeque fork on the market the Folding Camping Fork extends from 7.8″ to 48″, has a heat resistant handle, and a rotisserie turning knob. Visit www.RollaRoaster.com for more fun camping and campfire cooking ideas! Posted in Campfire Cooking, Camping and tagged barbeque fork, campfire cooking, camping, camping hacks, family camping, marshmallow toasting fork, S'moreos, s'mores, smart packing.